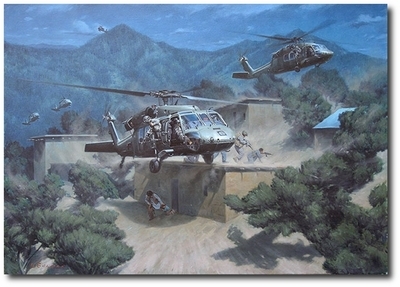 Depicts just one of scores of high-risk Air Assaults conducted by the 82nd Airborne Division and 7th Special Forces Group (Airborne) in Eastern Afghanistan during 2007. It demonstrates the full ability of our military to adapt to the most brutal operating environments and the willingness to use all means necessary to find, fix, and destroy our enemies. It is a testament to the courage of the men and women of our armed forces who put themselves in extreme risk on a daily basis to keep the United States free from terrorist attacks. It represents the countless sacrifices made by our Special Forces Soldiers who train and lead the security forces of Afghanistan to defend themselves and ensure a future free from the oppression of the Taliban and Al Qaeda. They are the "quiet professionals" who will never ask for any recognition for their efforts. Thanks to our military, there is nowhere in the world terrorists will feel safe. There is nowhere American Soldiers will not chase them to, and as this painting depicts, there is no such thing as a Safe Haven, and there will be no sanctuary for terrorists as long as the 82nd Airborne Division and US Army Green Berets remain "on point" for the nation.